Blackboard is providing academic users with access to historical multimedia resources from NBC Learn. The two companies today announced that that they've inked a deal to make historical and current events materials from NBC News accessible within the Blackboard Learn platform. 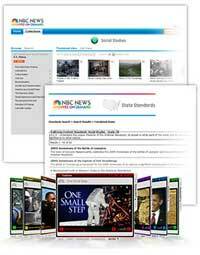 Through NBC News Archives on Demand, college and university students and faculty will have access to thousands of video and audio files, as well as textual materials, covering a wide range of topics, from politics to health. All of the materials can be embedded directly into Blackboard courses using the new Blackboard Building Block, which is being made available today at no charge. The service itself, however, is not free. As Blackboard described it, "As a result, educators can complement courses and lectures with historical and up to the minute video clips and other content on topics ranging from politics, the economy and climate change to health issues related to pandemic preparedness including the H1N1 influenza. Students get to participate in a much richer and more engaging course experience and can use the content and resources to support their own research, project work and presentations." According to Blackboard, the archival materials contain not only historical materials--including photos, transcripts, videos, etc.--but also continuously updated NBC News materials. "I'm using the archives to help students place what they are learning in a real world context," said Mark Rains, an associate professor at the University of South Florida, in a statement released to coincide with the announcement. "Very few of my hydrogeology students will go on to practice hydrogeology, but they will all live in a world in which the limited availability of water triggers a range of environmental and social implications. We read and hear about these problems in the media, but few really understand how to connect that news to the underlying principles of their academic work. I previously struggled to bring real time, real world content into the classroom and I'm hoping the NBC Learn Archives can help change that." The multimedia resources are available now through a Blackboard Building Block. There is a fee for the service. The Building Block itself can be downloaded free from Blackboard's extensions site here.